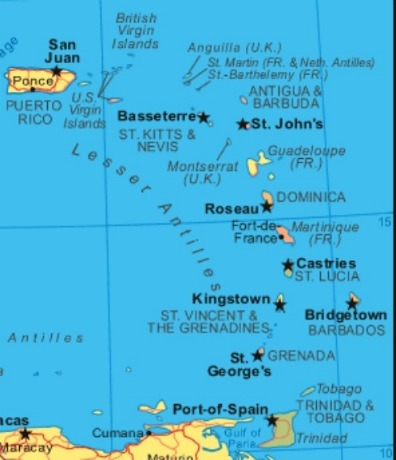 Here is a map of our cruising grounds, from the Virgin Islands to the north down to Venezuela and Trinidad in the South. This map illustrates that the longest distance from the British Virgin Islands to Trinidad, was 95 nautical miles... that was from Virgin Gorda, British Virgin Islands to St. Maarten. Taking an average of 5 knots you could plan on 120 nautical miles in 24 hours... so what's the big deal about going 95 miles or less? Sailing at night, why you do it? Because you want to arrive at your destination early in the morning...if something goes wrong underway you want to be able to enter your new harbor during daylight. So for instance when we went to St. Maarten, we would leave North Sound in Virgin Gorda at lunchtime to 2 PM... we wanted to arrive at the entrance to Simpson Bay well before 5:00 PM... the last opening of the drawbridge allowing access to the very calm Simpson Bay Lagoon. Living on a sailboat on passage always means...Safety first. Sometimes you leave at midnight, do all your prep work the previous afternoon. What do I mean by prep work? At anchor you pull your dinghy up and down with davits. When on passage you un hook the engine and put it on the stern rail on a motor mount. Tie off the dinghy to prevent it from swinging around. On a passage of over 24 hours you may want to pull the dinghy on deck with the main halyard. Without davits you should do this. If you tow a dinghy behind theboat it will slow you down about half a knot. Make sure you have the right chart laid out on the nav station. In the Caribbean the islands are so close you can navigate by sight, but the chart is always nice to have available. Safety first. Underway we were both in the cockpit, always wearing a safety harness connected to the jacklines. Jacklines are a safety device that you connect from the bow to the stern on either side of the top rails... you connected your safety harness tether to the jack line...you're connected to the boat at all times. For whatever reason... whenever I left the cockpit to go forward... even during the day... 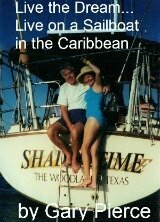 I always made sure that the first mate was up on her feet and aware of what I was doing. We never fell overboard in 8 years, but if you did you wanted to be attached to the boat. Only the stupid go below to sleep with one person up top...duh. The person on top falls over, they die while the first mate sleeps. Even with a jack line, if you fell overboard, and the other person was asleep below, you would have extreme difficulty getting back on board... meanwhile you're being dragged in the water at 5 knots... be smart make sure both of the crew are in the cockpit at all times... you can sleep there just as well as below. Thank you for reading sailing at night...this is often necessary, but very safe with common sense.